about a bewildered artist and his model or doll? mysticism and Don't Look Now. Hero Tarkan and his faithful wolf Kurt. 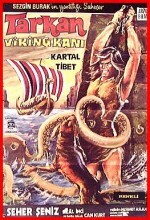 Kilink, from the swinging turkish 60's. after a swinging 1960´s italian model. Maybe the Mario Bava movie. Great Fun! and the best Superman movie - Ever. weird but fun superhero action. a serial killer on the loose in Istanbul. with a Making Of and interviews etc.